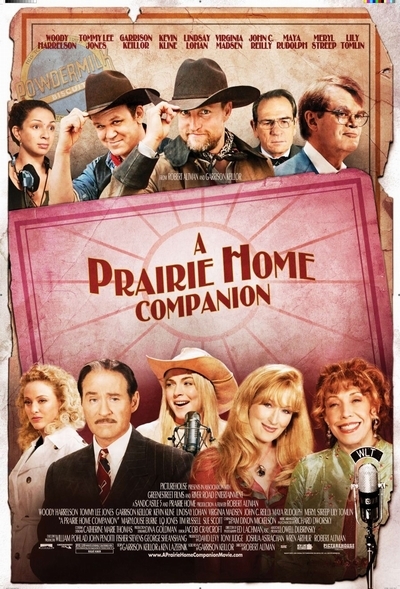 Story: Director Robert Altman and writer Garrison Keillor join forces with an all-star cast to create a comic backstage fable, A PRAIRIE HOME COMPANION, about a radio variety show that has managed to survive in the age of television. Meryl Streep and Lily Tomlin star as the Johnson Sisters, Yolanda and Rhonda, a country duet act that has survived the county-fair circuit, and Lindsay Lohan plays Meryl's daughter, Lola, who gets her big chance to sing on the show and then forgets the words. Kevin Kline is Guy Noir, a private eye down on his luck who works as a backstage doorkeeper, and Woody Harrelson and John C. Reilly are Dusty and Lefty, the Old Trailhands, a singing cowboy act. Add Virginia Madsen as an angel and Tommy Lee Jones as the Axeman and Maya Rudolph as a pregnant stagehand and Keillor in the role of hangdog emcee, and you have a playful story set on a rainy Saturday night in St. Paul, Minnesota, where fans file into the Fitzgerald Theater to see 'A Prairie Home Companion,' a staple of radio station WLT, not knowing that WLT has been sold to a Texas conglomerate and that tonight's show will be the last.